Clint Harris (1st Pirate from left) defends against Duke. If Clint Harris could go back and change anything in his athletic career, it wouldn’t be his all-too-short stint in the National Football League. It wouldn’t be his choice of colleges or his dual commitment to both football and track. No, if he could change anything, it would likely be to somehow re-write the end of East Carolina's storied 1983 campaign. He wishes that season's well-deserving top-20 team that went 8-3 in the face of one of the nation’s most brutal schedules had received the bowl bid it deserved. Instead, after all of the bowl pundits had concluded that an East Carolina win on the road at Southern Miss would assuredly land the Pirates in the Independence Bowl, the victory was followed by the spirit-shattering news that the bowls would collectively shut out the Pirates while passing along invites to mediocre teams like the 6-5 UNC-Chapel Hill club just down the road. It was an abrupt and painful departure for one of the most athletically gifted players to ever come through the gates at Ficklen Stadium. 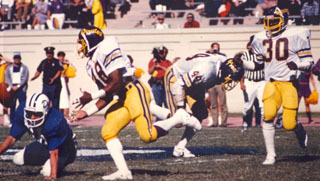 Still, Harris cherished the entirety of his career as a Pirate and to this day follows his alma mater on the gridiron. “ECU helped me be tenacious and develop my drive,” he said. “Coming from a school that wasn’t as well known, it makes you work that much harder. I think everyone grows up and then something happens and maybe you possess an ability to do something at a high level and because of it, you then become known (in the public eye). The young Harris didn’t need to look very far to find inspiration in the football world as his cousin, Charlie Stoops, played for the Baltimore Colts on the 1971 Super Bowl Championship team. While his aspirations were developed early through his cousin, his ability to play the game himself was honed in many a backyard ballgame. His love for football drove his track career as well. “I always wanted to stay in shape for football cause I really liked football, so I ran track to do that,” he explained. “I was really good friends with the track coach at the time in high school and he needed some sprinters and I was kind of fast, but I would say I wasn’t extremely fast at that time. But track kept me in shape. And then as a senior, I got really fast. I still hold the record at Great Bridge High School in the 100 meters and went on to become (prep) All-America in track. I had, I think, the fourth fastest time in the nation as a senior. After moving to D.C. for a year, the family returned to Chesapeake and it was that year, his junior year, that Harris began to emerge as a bonafide star at Great Bridge High School. Despite the injury, Harris persevered. Harris’ exploits on the field and on the track opened a lot of doors of opportunity when colleges started coming around and he had his heart set on competing in both sports — a decisive advantage in ECU’s favor. “I had both football and track schools calling and I was definitely going to go to a place where I could pretty much do both,” Harris said. “I think I was one of the top 100 recruits in the nation and I visited a bunch of schools and had a suitcase full of letters from colleges. It was a fun, fun time for a 17-year-old, you know… having that many people come at you and give you that much attention. As anyone around Emory knew, it was then-wife Nancy who closed many, if not most, of the recruiting deals for the coach. With Harris, it was no different. Though Nancy was a big influence, the school itself was a powerful attraction. And his decision was greeted with excitement from the home front. “It was always my decision,” he said. “People wanted me to go where I was comfortable. That was why it was easy. I wasn’t pressured into going to any particular school. I did have someone who wanted me to go to BYU and that is why I took a visit out there. But no one really said, ‘I want you to go here or you have to go there.’ I was very open to all the schools but I just went where I felt most comfortable. It was definitely my decision to go there since I was the one who was going to have to be there, live and be accepted or not. Go to classes and the other stuff. It took Harris only two games as a reserve to work his way into the starting lineup. Once he did, he never relinquished his anchor position in the secondary. And the new talent in the program came to quickly identify each other. That group was a very tight one and it began that first year. “I remember all the freshmen were in this suite — 216 in Belk Dorm,” he recalled. “All the upper classman had this thing where they would go to each suite of the freshmen and beat them up. So we all huddled in one room so we said, ‘When they come — we had myself, my roommate Steve Hamilton, Ronald and Donald Reid, Jeff Pegues were there along with this little kicker named Pierre — and we all huddled in the room and when the upper classmen came and the door cracked open, we started punching them, so they left us alone. That toughness also carried over to the field right away. Though Harris was heavily talented, he knew he had to learn and learn fast to be as good as he could. In retrospect, he points to Emory and his staff for helping him become a great player. “As I got on, coach Al Mason — who was my last position coach there — ... we really butted heads because I was coming off an Honorable Mention All-America season going into my senior year and he was a new coach trying to change things. And I’m thinking, ‘I know what I know because I had already done it.’ So, we butted heads there a little. But that pretty much helped me. His physical gifts and the know-how that he learned from the coaches made up two thirds of the recipe for Harris's success. And like many of his contemporaries, he looked to Emory for that final ingredient. You would think that a star player wanting to run track would not set too well with Emory. 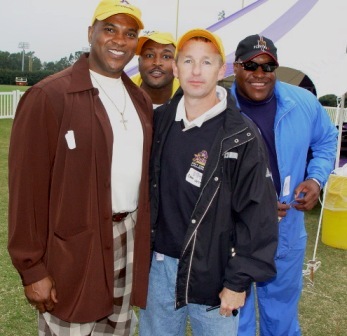 With Emory’s blessing Harris explored his track development with the legendary Pirates coach Carson. And Harris made sure the two sports could co-exist. And he found success on the oval. Though he sounds like he didn’t take his track all that serious, it isn’t true. In fact, Harris found a level of competition there that he could not indulge in on the gridiron. “Track is all you,” he said. “You can be selfish in track because it is what you put out that is judged. You may run on a relay team with four guys, but for the most part you can’t blame anyone but yourself. If you have a false start, you have a false start. If you didn’t win that race, then you lost that race. People who run track need immediate gratification and I’m no different there. The whole thing is over in less than 10 seconds, or at least it should be. I really like the immediate gratification and immediate individual attention track gave me. I liked the travel. People saw who you were as opposed to football, where you are covered (in gear). Well before 1983 arrived, Harris and many of his mates could see the team progressing toward that breakout season. “Yeah, I think as far as the team was concerned, we knew we were definitely becoming a good team,” he said. “Everyone knew and trusted each other and that was really big for us. We knew what the other person could do and would do at a given time. We saw each other working in gym and on the field at practice. We ate together, we went out together, we lived together and we didn’t want to let each other down. “We knew that Earnest could run the ball, we knew that Terry would knock you out and we knew that Norwood Vann and (Damon) Pope could catch the ball. We knew that (Kevin) Ingram could throw the ball. We knew that if everyone did their jobs we would be ok. That is what happened in 1983. We knew if we were not THE strongest, then we were one of the top two strongest teams in the nation. We knew no one was going to break loose for 100 yards on us, because they couldn’t break loose on us. From an individual standpoint, Harris says 1983 was not a great year for him statistically. The closeness of the team and the on-field success was a life-altering experience for him. Harris also admits, it was one hell of a fun ride. He shared some of his personal standout memories. “We got shirts if you had a really good hit, and we all started seeing who could hit the hardest,” he said. “I remember the first and only spring football season going into my senior year. It was always competition between the offense and defense and all of the receivers were always talking smack to all of the defensive backs. Every year I was there I never heard it because I was not in spring practice. So when I did come, they were talking smack again, saying things like, “Oh the All-America is here… we’re going to beat you the same we do your boys. And there were other great memories. Like most competitors, the mistakes and the lowlights tend to burn brightest in their memories and with Harris, it is no different. “It was probably the worst thing I thought could happen (not getting the bowl bid in 1983),” he said. “We wouldn’t have even guessed that we weren’t going to a bowl game. We lost three games. We lost to the national champions by five points in a game where we had them beat. Every single game you can go back and say that we could have and maybe should have won… I mean every single game! And then, to not get anything and watch a 6-5 Carolina team go. It just shows you how it is even now with the BCS — the best teams don’t always get to go. That is probably why there are more bowl games, because there were more teams that deserved to go besides us. From the moment Harris stepped on the gridiron at East Carolina, he appeared destined to be on of those players who would be a lock for the NFL. He was so physically dominant and so fast on the field, it just was a forgone conclusion he would play on Sundays. So, when he wrapped up the 1983 season, it was to no one’s surprise that teams came around for him. One of the teams from the Big Apple made the call in the 5th round, for the 115th selection overall. “I knew they were interested, but you don’t ever really know to what degree unless you are up for the Heisman Trophy or something,” he said. “I worked out with teams at the school as well as at the NFL Combines. The team that drafted me was the New York Giants and I didn’t even remember talking to them, which I thought was kind of weird. There are a lot of politics in the NFL too. It shouldn’t be that way. You get paid to do it, so it should be the best people who get on the field. It was nice to be able to play in the NFL and get an opportunity. It was a dream come true. When then-coach Bill Parcells drafted Harris, the thought was that the Giants could convert him to strong safety. It didn’t work out. Still, he had hoped to make it work, but that initial season — even before he could overcome the discomfort with the position change — he got injured. Denver represented Harris’s one real shot, unencumbered by politics, and it almost didn’t happen. “After (the strike season), I came back home to Virginia and then I got married in 1987,” Harris said. 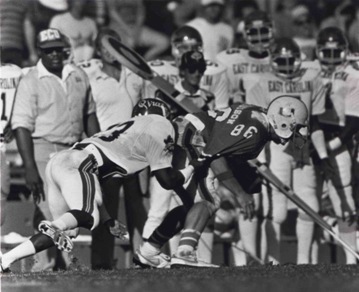 “George Rogers and I became good friends and worked out together and he was like, ‘Why aren’t you playing, you are killing me out here?’ Now, this was the Heisman Trophy winner from 1980-something. He is who actually told me that he had heard I was blackballed by the League. But, to have had a fair shot was worth it to Harris. With the end of football, Harris went through a number of transitions en route to his current career, though he knew down deep he would end up in the restaurant business. “I had worked in restaurants even before I retired,” he said. “After football, I took a year off and traveled a little. After that, I got into restaurant management. First I worked with a company down in South Carolina and then did another in Atlanta. I also did two years of all-male calendars, which is a funny thing. So then, I was ready to get out of my first marriage. She was a girl I had met at ECU — a Pure Gold dancer. Fortunately, I didn’t have any children with her. And his father-in-law was former Chicago Bears’ star defensive back Bennie McRae, so you can imagine the conversations they have when the subject is football. For Harris, the second go-round with marriage was the charm and he indulges himself in his children. “My daughter is more into sports than my son right now and she is definitely a daddy’s girl,” he said. “She runs and is very physical. She does ballet right now. My son is mostly into computer games at this moment. He is just 11 though. My friends are like, ‘Why don’t you have him playing any sports?’ But I want him to do what he wants to do because I don’t believe in pushing a kid into doing something. We have kids in the neighborhood that play organized sports that are his age and he just tosses them around. He is about 115 pounds and he can lift 115 pounds and he is quick. With a strong family, Harris has excelled in his second career. “I have been training restaurants ever since I retired,” he said. “When I was in college even… actually, I got my first restaurant job my last year of high school when I worked at a country club in Virginia Beach. I liked it. I like to cook and I like to eat, honestly, so I got into it there. Then an alumnus from East Carolina, Gene Smith, who owned Zero Subshops in Virginia Beach, Norfolk, Chesapeake, had another shop called Rockefellas Raw Bar, and that is when I really got into it. I enjoyed hanging out and meeting people and having a good time. It is never boring. Everyone likes to talk about something. 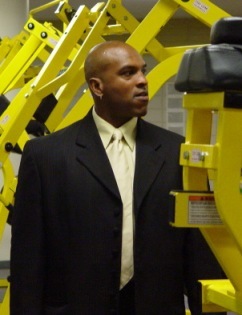 Harris drew on lessons learned on the Pirates football field in his new career. Though Harris doesn’t get back to Greenville as much as he would like, when he does, it always feels like it was just yesterday that he was there. Bonesville: Do you follow the Pirates football program? Bonesville: What are your thoughts on the new head coach, Skip Holtz? Harris: I haven’t had a chance to learn a lot about him yet. I do know, that you have to have someone who bleeds the same blood you bleed. It is hard to have someone there that is not a true Pirate, meaning, they don’t have any roots there and can’t really tell the players how it used to be at ECU and how it can be again. It is going to be hard. I think you have to stick with something or you will always be in the rebuilding stage. You can’t rush to hire someone. You have to take the time to hire the right person, someone willing to grow with the program. I know just from knowing sports and business every time you change managers, there is a slight decline in the performance. Rarely do you get a team this bad who is 10-2 the next year after changing coaches. Bonesville: What are your thoughts on the current BCS situation? Harris: It is a mess. Teams are too good and too closely matched in abilities. It is tough to see them just pick a couple of teams from a group of undefeated teams. It’s like the saying, ‘On any given Sunday anyone can get beat.’ Look at the NFL. You will always have those teams out there that are elite and winning 10, 11 games, but on any given Sunday, you can be beat. It needs to be decided on the field. There needs to be a playoff system and that is the only fair way for a team to win or lose it on the field and all teams should have an equal shot (at the playoff field).